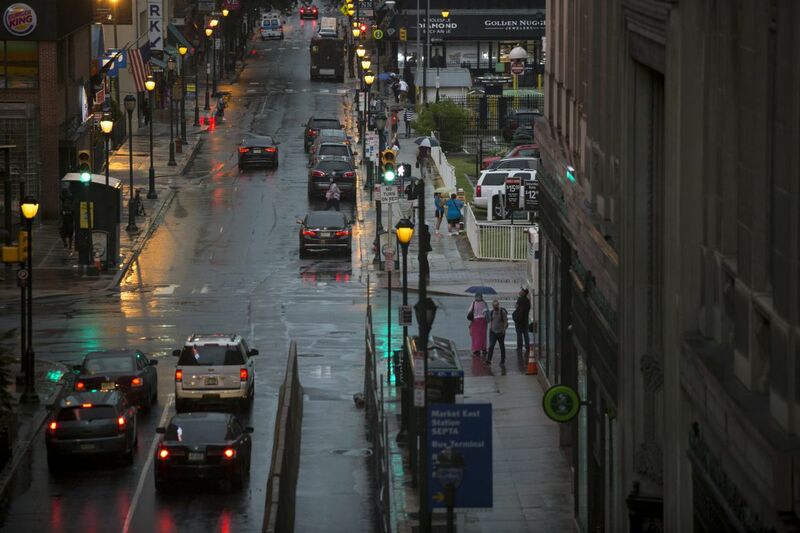 Rain pours on Center City; a common sight these days, and a repeat is coming soon. A flash-flood watch is in effect for the entire region through Saturday afternoon, and the National Weather Service is saying that yet another round of heavy rain might coax some streams out of their banks. Right now the most-vulnerable areas appear to be just south of the city, but this being summer, and the atmosphere being its chaotic self, it's impossible to predict bull's-eyes. Rains are all but a certainty during the day Friday and could persist into Saturday night, with the potential for 2- and 4-inch amounts, perhaps more to the south. By now the region might have a certain jaded attitude toward the threat of downpours, but this time around the recent soakings that have saturated the ground increase the chances for flooding and trees being uprooted. Philadelphia so far this month has had close to 5 inches of rain officially, 1.3 above normal, and Wilmington's total is approaching 6.5. On the plus side, the region's rivers and streams still remain at generally harmless levels. For example, the Delaware River at Trenton was at 10.5 feet on Thursday morning; flood stage is 20. The Schuylkill at Pottstown was at 4.7 feet; flood stage is 12.5. But heavy rains in a compressed period could cause smaller streams to slosh over. As we've mentioned, generally this has been a wet period with an increase in extreme rains, defined as 2 or more inches in a calendar day, and various studies have linked that wetness to a bump in water vapor from worldwide warming. Across the contiguous states, about 10 percent of the country experienced such rains annually from 1901 to 2000, according to the National Centers for Environmental Information. In the 21st Century, that number has jumped to 16 percent.